I just ran across a funny/cool website called woodenbkes.com. One thing that the author seems to say quite often is "Bike design and execution are actually very forgiving if your expectations are low enough." I guess that's true of most things if you think about it. The Ubuntu install ran automatically and without a hitch as expected. The difference in speed between running from a CD and running from a hard drive is also pretty substantial. 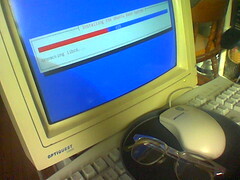 In all, I consider it a good alternative to re-installing Windows 98 or 2000 as XP was never really an option with this computer. It even recognizes my ISA to PCMCIA adaptor, and Orinoco Silver wireless card. It will take some futzing to get it to get it to actually connect to the router and transmit data, but it's a promising development. It's just like a real computer now. Sick Days. Perfect Times for Geeking. What can I say? I'm told that I have some sort of viral bug. Judging by the mild severity, it's not the flu, but still I just don't feel up to doing anything that involves standing upright or moving from place to place. Seems like the perfect time to install Ubuntu to the old Pentium III. I've been using it off and on, just for fun, for some time now with a "Warty Warthog" live CD since its own hard drive died. I also tried "Breezy Badger", but on this old box it didn't run very breezily. Ubuntu live is pretty nice, but I want something a little more permanent and customizable. To that end, I yanked the drive out of an old Compaq with a terminal case of proprietaryness before carting it off to be recycled. It's a 4gig Bigfoot drive. No frills here. Just a 5.25" half height drive to put my OS and a few files and programs on. I installed the drive some time ago, but have not had a chance to put the OS on it yet. So, here we go. Wish me luck. A Fad? A Trend? I Hope. Velomobiles. I have to say I've become a little obsessed with them lately. Last summer, I found that riding a bicycle to work can be a really great way to commute. It's healthy, it's energizing, it's cheap and it doesn't pollute the air. What's not to like? There are even electrically assisted bikes for those whose want to get there fast is greater than their level of fitness. Well, there are some difficulties. Weather, for instance: in most climates, if you don't plan ahead for it you will eventually have problems. Didn't bring your rain gear? Tough luck if you get caught in the rain miles from home. Even bigger problems if it's not a warm summer shower. Want to carry a couple bags of groceries home from the store? I suppose that with the proper accessories (packs, panniers, trailers, etc.) you could get the job done on a bicycle, but it might not be an easy task. While velomobiles may be heavier than most bicycles, they do help to address these problems as well as others with enclosed storage and cockpits and offer a practical alternative to driving a car for most short trips around town. I can't say that I expect great numbers of people to sell their cars (or even second cars) in exchange for velomobiles, but if they were more common, or even if the average American knew what one was I think they would at least have a bit of a presence in this country. (I'll stop short of predicting popularity.) I think, at least in my own web-headed version of reality, that awareness is growing. For instance, Wired magazine recently ran a story on velomobiles. Out in the world, people are seeing this and making it part of their knowledge. I like to use del.icio.us as a way of guageing popularity. If a del.icio.us user sees something and wants to be able to find it again he or she will most likely link to it. Since that Wired article, links tagged as "velomobile" have started getting more popular. There's a long jump from linking to a velomobile-related website to dropping thousands of dollars on a velomobile, but nobody will make that jump unless they know about it. Now I wish there were some way that I could be outside riding a bicycle... in the rain and not get wet. Now wouldn't that be great? Hmm? 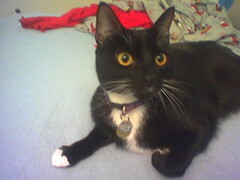 As of yesterday, Boots has been confined all day, every day for three weeks. In another week we'll take him back for more x-rays, but for now we're doing the best we can to keep him contained. He clearly feels better and has a lot of excess energy. Where his brother Bucky once would reach into the cage to bat at him and tease him (and still often does) Boots now often reaches out to start trouble when Bucky passes close by. When we do allow Boots out for a brief break from the cage we must give him our undivided attention or risk seeing his tail disappearing down the hall to jump, run and explore the places he has been kept from. However, we've been dealing with this situation for much too long to risk letting him re-injure himself. He wants out. We want to let him out. We can't, though. Not yet. 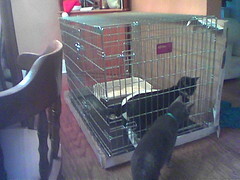 It's been 10 days since Boots' fracture required us to begin keeping him confined. At first it was hard. He cried almost constantly, but eventually he learned to accept the situation and just make himself comfortable. For a while. Fortunately, the rest he is getting does seem to be helping. He now is able to walk normally, and seems comfortable moving around. This is proving to be a problem. He now feels more like running and jumping and less like sitting in his cage. Just this morning, as I opened the door to place a fresh bowl of water there for him, he sprang over my hand, which had been holding him back, onto the sofa and off the other side within the space of about a second. I seriously hope he did not re-injure his back. I don't know how much longer any of us can take this. I know, I haven't been posting. There's been so much happening lately, that I haven't had time to post on any of it. 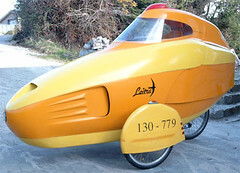 Lately, I've had a growing interest in human powered vehicles, also referred to as velomobiles or HPV's. They are an idea which hasn't really caught on, I guess. Most are recumcent bikes or trikes with some form of aerodynamic shell, which tends to make them pretty fast, as bikes (or trikes) go. Imagine a kayak with wheels. In the interest of finding out a little more about them, I went to Yahoo groups and did a search in the groups for HPV, having come up a little lean when searching for "velomobile". "Jackpot!" I thought as I saw that there were over 300 groups with HPV in their descriptions. Joy quickly turned to discomfort, however, as I realized that practically all of the groups had something to do with herpes. As it turns out, HPV also stands for "human papillomavirus." Heh. Reminds me of when a friend did a google search at work for "swing dancing" and wound up with some unsavory links. Time for some new search terms.